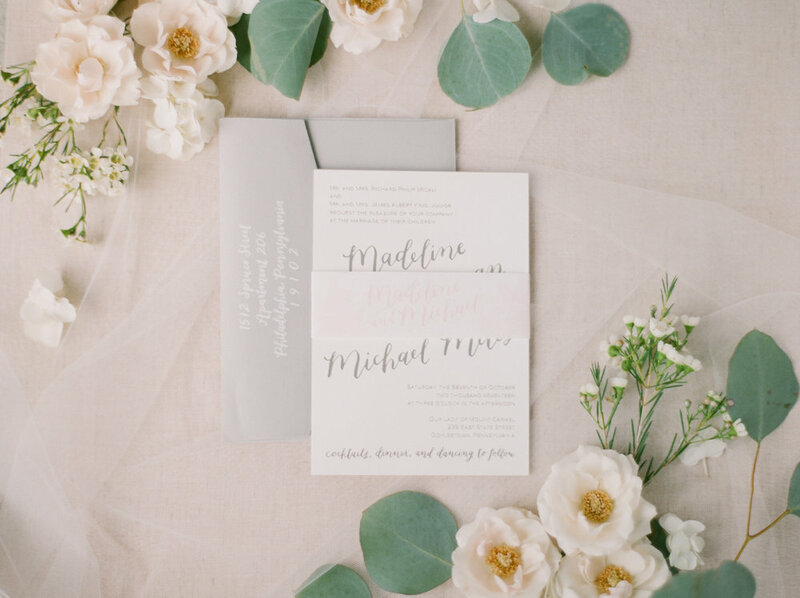 Madeline + Mike's custom invitation suite was filled with soft grays + pale blush florals, with hints of marbling. Some of these elements made their way to Madeline + Mike's wedding day-of details, and it was an honor to be a part of their wedding day! I'm looking forward to sharing more behind their invitation suite (and how we brought some of those details into their wedding day) soon. Jaclyn + Ryan's custom invitation suite was full of bold contrasts, florals, stripes + hints to their Irish heritage. Being able to bring those elements through from their invitations to their wedding day-of details was a huge honor, and such a fun collaboration! I'm looking forward to sharing more behind their custom invitation suite (and their day-of details) soon. Happy second anniversary to Sarah + Bryan! My favorite part of working on any project are the tiny details that make it uniquely YOURS. The little add-ons that are significant just to you + your person, both as individuals and as a couple, always make your pieces more YOU, and being able to weave those parts of your story into your day.. Your favorite soda, a nickname, first date spot, shared vacation places, or any other part of your story.. THOSE details always make me the most excited..
Sarah + Bryan's invitation suite is a great example of those tiny details - a collection started when they were dating and an idea that she wasn't sure was possible? YES, PLEASE! Let's do it! The starting point for Sarah + Bryan's invitation suite was pretty unique - modern art stamps that Sarah had collected while she and Bryan were dating. The slightly oversized stamps were both horizontal and vertical, and had mini masterpieces printed on them. Those bold spots of color and print were the perfect punch of color to pair with an otherwise monochromatic invitation suite. They wanted something clean, chic and timeless to tuck inside the envelopes. We went with an oversized invitation - so, so pretty! Because Sarah loves raised texture, we ended up going with embossing rather than foil or letterpress. 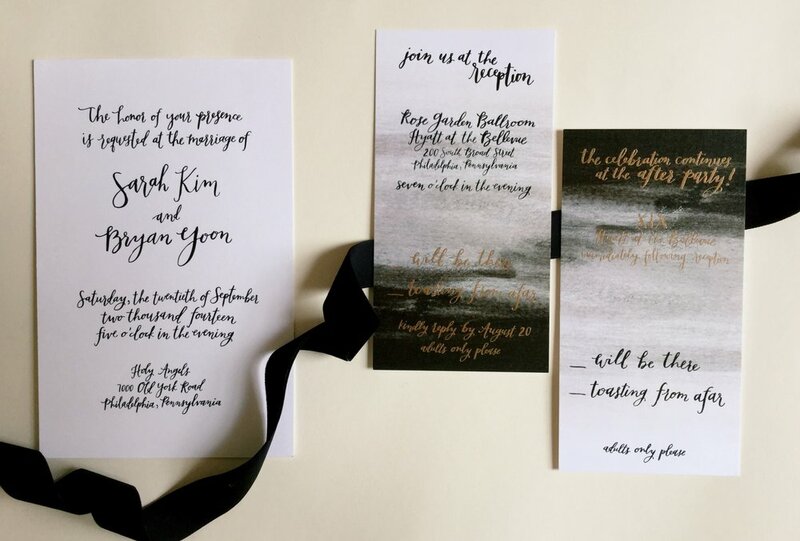 The raised calligraphy on the oversized invitations was SUCH a cool touch to add! Sarah also had a very specific original idea for their response cards that she hadn't seen. She knew she wanted something tall and narrow- not a typical rectangle, and Sarah wanted an ombre effect in the background. Because the reception + after party required separate head counts, we reversed the ombre to make it a little more obvious that they were two cards. I completely love the mix of a very chic, classic + minimal invitation with something a little more fun on the reply cards. It's all cohesive, but it's not boring at all.